It was a fine, sunny, early summer evening when the company, which grew to about sixty people, began to gather at the little church on the quiet country road to that leads to Tyrella Beach. 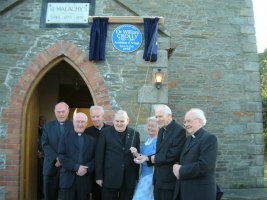 St Malachy’s is in the townland of Ballykilbeg (the townland of the little church!) where William Crolly was born in 1780. 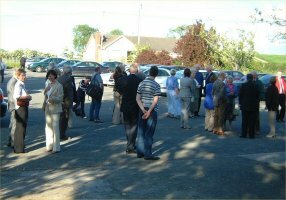 There were members of the Ulster History Circle and of the Lecale Historical Society, many people from the parish and further afield. Bishop of Down and Connor Patrick Walsh was accompanied by Canon Brendan Murray and Fr. Glavin from the Parish of Downpatrick of which the church is a part. Archbishop Brady was represented by Monsignor Raymond Murray PP Cookstown and Monsignor Ambrose Macauley was in attendance to give a talk about Archbishop Crolly. Two generations of the descendants of the Crolly family were represented. 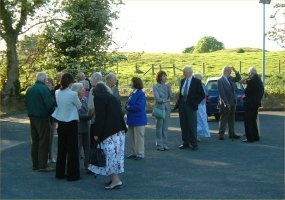 Although the wind was cool in the shade of the setting sun, the atmosphere was warm and welcoming as the company chatted in the few moments before proceedings started. Mrs Doreen Corcoran, Chairperson of the Ulster History Circle, welcoming the gathering, was pleased at the number of people who had come to honour a worthy son of the area. Bishop Walsh performed the unveiling ceremony and the company entered the church to hear Monsignor Macauley’s talk. 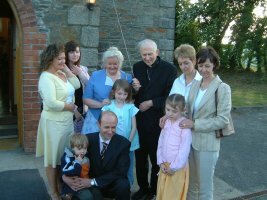 The Monsignor, whose scholarly book about the Archbishop has been widely acclaimed, said that the Crolly family had been in the area since Anglo-Norman times. Originally called Swords, the family had adapted the Irish form of the word. Once extensive landowners in the County most of it had been sold in the 17th century due to a family dispute. The townland of Ballykilbeg remained in their hands until 1784 when it was sold and the family remained on the land as tenants. 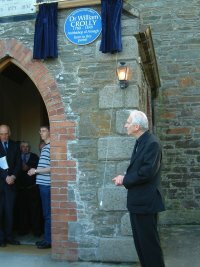 William Crolly was known for his liberal views on inter church relationships and was something of an ecumenist before his time. His relations with the other main churches during his time a Bishop of Down and Connor was excellent, demonstrated by the way in which financial support for church building and for Catholic Emancipation in the 1820s was extended by Presbyterian and Church of Ireland alike. 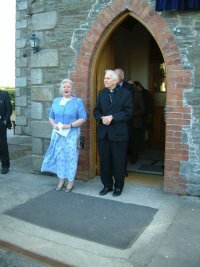 Monsignor Macauley described some of the controversies in which the Archbishop became embroiled, involving education and the role of the church in its management and oversight. However, his life was taken by the same disease, cholera, which caused so many fatalities in the final years of the Famine. The company adjourned to the Parish Centre in Downpatrick where Canon Murray had kindly provided refreshments, an occasion for further discussion over a refreshing cup of coffee.